Fungi are diverse and widespread. They are essential for the well-being of most terrestrial ecosystems because they break down organic material and recycle vital nutrients. 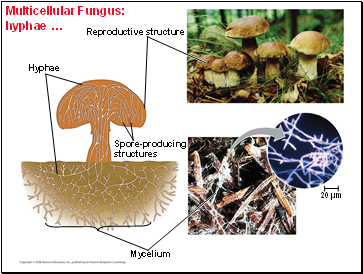 Fungi are heterotrophs and absorb nutrients from outside of their body. 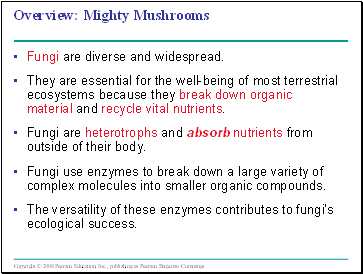 Fungi use enzymes to break down a large variety of complex molecules into smaller organic compounds. The versatility of these enzymes contributes to fungi’s ecological success. 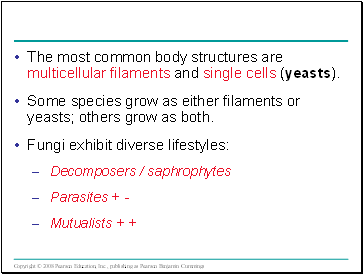 The most common body structures are multicellular filaments and single cells (yeasts). Some species grow as either filaments or yeasts; others grow as both. The morphology of multicellular fungi enhances their ability to absorb nutrients. 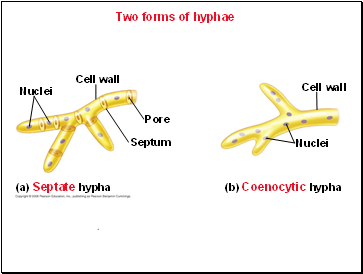 Fungi consist of mycelia, networks of branched hyphae adapted for absorption. 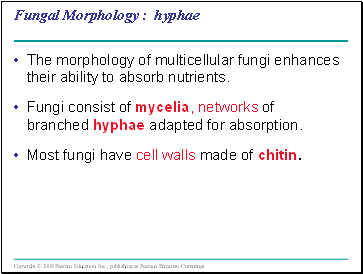 Most fungi have cell walls made of chitin. 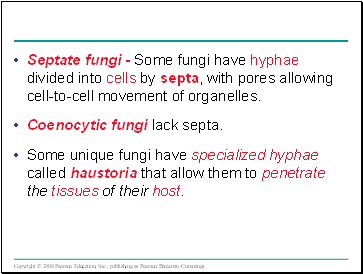 Septate fungi - Some fungi have hyphae divided into cells by septa, with pores allowing cell-to-cell movement of organelles. Some unique fungi have specialized hyphae called haustoria that allow them to penetrate the tissues of their host. 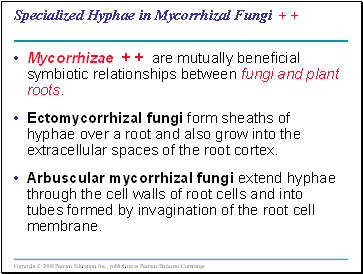 Mycorrhizae + + are mutually beneficial symbiotic relationships between fungi and plant roots. Ectomycorrhizal fungi form sheaths of hyphae over a root and also grow into the extracellular spaces of the root cortex. 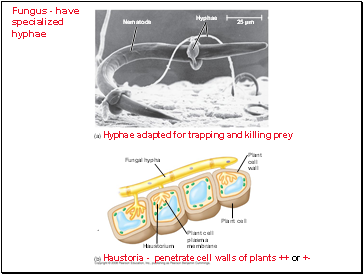 Arbuscular mycorrhizal fungi extend hyphae through the cell walls of root cells and into tubes formed by invagination of the root cell membrane.